Do you feel the mushiness and feel good vibes? Because Valentine’s Day is around the corner and love is actually in the air! Finally, that day of the year has arrived when we celebrate love in full swing. Valentine Day is knocking on your door and to make V-day memorable we usually ring into v-day mode with expensive gifts, roses, assorted chocolates and prefer a peaceful candle light dinner to end Valentine’s day on a romantic note. But what if you didn’t get much time to plan your valentine day because you were burdened with work back in office or your bad health came in the middle of your v-day plans or maybe you ran out of money. Call it a bad luck or something, but before you act like joy killer and end up feeling wasted then take note. Because when you have nothing you have movies! Movies are a magnum source of entertainment – a rollercoaster ride filled with emotion, drama, laughter and fun. Everybody devour watching love stories and since ‘tis the season of love’ why not watch romantic flicks with your ‘chosen one’ and cuddle at home. So, go grab your valentine and some popcorn, (also tissues) because we bring you the best Hollywood and Bollywood lovey-dovey movies which will make you fall in love all over again. A romantic masterpiece which stars Jim Carey and Kate Winslet in lead roles is a story about two lovers who chose to erase memories about each other after a spat with a help of a procedure. Joel (Jim Carry) and Clementine (Kate Winslet) both have strikingly opposite personality but they fall for each other while on a train journey. But actually, they don’t realise that they are former lovers who were together for two years. Most of the situations take place in Joel’s mind as he keeps some of the Clementine’s happy and positive memories in reserve. The film revolves around present and past situations shared by Joel and Clementine. Collectively it’s a moving and emotional romantic drama ideal for Valentine’s movie mania. When we hear the word Titanic the first thing comes in mind is the soulful tune of the movie’s famous song My Heart Will Go On. Titanic, a 1997 movie which stars Leonardo Di Caprio and Kate Winslet is romance-disaster film which foretells the story of a guy named Jack Dawson, played by Di Caprio is a penniless artist who loses his heart to enchanting beauty Rose, essayed by Winslet who is rich, high in status. Jack and Rose become friends and their friendship turns in love and the rest is history. Apart from romance and love sensual scenes the movie has jaw dropping scenes of sinking Titanic and how water engulfs the gigantic ship that transforms titular ship into ship wreck. Titanic has a disheartening end. Jack dies but he lives in Rose’s heart forever and that’s what makes the movie more outstanding. Online dating, social media relationship is common these days but back then in 1998, internet’s outreach was not so big. You’ve Got Mail, is probably the first and the best movie about online romance of pre-internet era. This amazing rom-com features Tom Hanks and Meg Ryan in lead roles where Tom Hanks, Joe Fox who runs a family business of mega book store and Kathleen Kelly played by Meg Ryan owns a little street side book store. Joe and Meg secretly chat with each other online via-email, unaware of the fact that they are business rivals. Their friendship elopes into romantic relationship their secret online love story and heart-warming hide & seeks of Joe and Meg’s real identities will keep you hooked throughout the movie. Based on a novel of the same name this heart-warming, romantic movie has young actor like Shailene Woodley and Ansel Elgort in key roles. 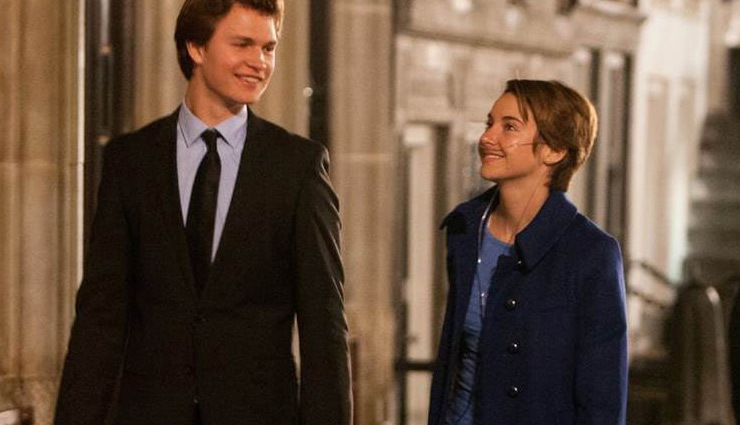 Hazel Grace Lancaster (Shailene), a sixteen-year-old cancer patient is forced by her parents to attend a cancer support group where she meets Augustus Waters, another cancer patient which is essayed by cute, charming Ansel. Hazel and Augusts begin to enjoy each other’s company and gradually they fall in love. Hazel who wishes to visit Amsterdam to meet the author of her favourite novel An Imperial Affliction but due to medical and financial constraints she is denied visiting Amsterdam. Augusts secretly arranges a surprise trip to Amsterdam for Hazel. During their visit to the city they get emotionally and physically closer and realise they can’t live apart. The love story has a tragic end that will leave you with teary eyes. Longing for love and infinite believe in relationship even after you are left all alone makes The Fault In Our Stars out of the league love story. Fondly called as DDLJ by Bollywood buffs we should consider this as one of the best romantic movie of Bollywood. It’s by far SRK’s most celebrated movie which still can leave viewers spellbound with intact magic and Shah Rukh’s romantic antics. Raj and Simran the epic on-screen Jodi of Shah Rukh and Kajol are hailed as epitome of love. Hence, every girl wants a boy like Raj and every guy dreams about Simran. Shah Rukh and Kajol’s chemistry, the music, drama, dialogues and 6how Raj crosses all the hurdles to get his Simran will keep you glued to the screen. DDLJ was one of the three Hindi films to feature in reference book ‘1001 Movies You Should Watch Before You Die’ and the longest running film in the history of Indian cinema. From the day of its first release it is still being shown at Mumbai’s Maratha Mandir for last 20 years. So, all the Raj and Simran in the house! It’s time to fall in love again.